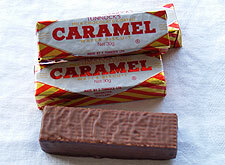 Tunnock’s Caramel Wafers are a candy bar, consisting of five layers of wafer with four layers of caramel in between. The wafer and caramel layers are the same thickness. The most popular version, a milk chocolate version, is wrapped in red and gold foil. A plain chocolate version is wrapped in blue and gold foil. The caramel is made on site from brown sugar and condensed milk. The chocolate is also made on site, and also uses condensed milk. The batter for the wafer layers is baked in large flats, then cut into large rectangles a bit bigger than the size of a standard piece of paper. A wafer layer passes under a caramel coating machine to receive its first layer of caramel. It is then topped with a second wafer layer, then the growing bar goes back under the coating machine for more caramel, the process being repeated until the bar has its five layers of wafer. It is then cut into the bar sizes, after which the bars travel to the area where they are coated in chocolate. The bars are let set, then wrapped for shipment. Tunnock’s Caramel Wafers sell very well in the Middle East. A version called the Caramel Log is prepared as above, then covered with toasted coconut. The Caramel Logs are very popular in Newfoundland. Tunnock’s Caramel Wafers were first made and packaged — all by hand — in 1952. The creator, Boyd Tunnock, wanted to make products that had a longer shelf life. 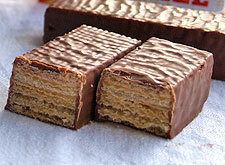 He decided to make caramel wafers such as those made by Kemps and Gray Dunns. In 1951, he bought Italian wafers, and tried making caramel to put in between them. The caramel he made didn’t work out. He was referred to a man who worked in a toffee factory, who came over and showed him how to make the caramel. Tunnock’s Caramel Wafers hit the store shelves in 1952. The current wrapper has not changed since it was developed in 1955 by the Robinson Wax Paper company of Bristol, England. For history of the Tunnock company, see the entry on Tunnock’s Teacakes. 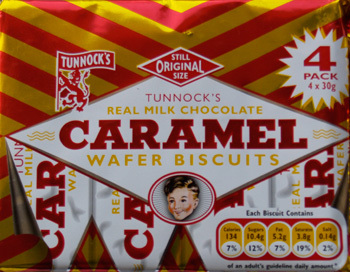 A Tunnock’s Caramel Wafer Appreciation Society was founded in 1982 at St Andrews University in Scotland. There is also an appreciation society on Facebook. Murray-Watson, Andrew. Why Boyd is happy success is wafer-thin. Edinburgh, Scotland: The Scotsman. 4 January 2001. Lawrence, Sue. Life is sweet. Edinburgh, Scotland: The Scotsman. 12 June 2005.